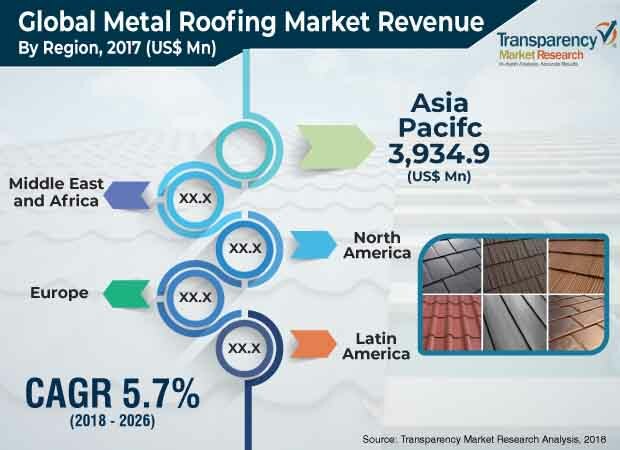 The global metal roofing market was valued at US$ 14.1 Bn in 2017 and is projected to expand at a CAGR of 5.3% from 2018 to 2026, according to a new report published by Transparency Market Research (TMR) titled ‘Metal Roofing Market – Global Industry Analysis, Size, Share, Growth, Trends, and Forecast, 2018–2026.’ Growth of the construction industry is expected to augment the demand for metal roofing from 2018 to 2026. Increase in construction activities and rapid urbanization in developing countries are estimated to boost the global metal roofing market from 2018 to 2026. Significant growth of the construction industry in developing economies and rise in the use of recyclable roofing materials have boosted the adoption of metal roofing systems. Furthermore, the construction industry in Asia Pacific and the Middle East has expanded at a rapid pace in the last few years. This trend is projected to continue in the near future. Rapid urbanization and increase in government initiatives for infrastructure development in developing countries are driving the metal roofing market. Metal roofing systems have nearly twice the lifespan of conventional roofing products and they are eco-friendly. As a result, these roofs are highly recyclable and reusable. These factors are projected to increase the demand for metal roofing products during the forecast period. The global metal roofing market has been segmented based on type, metal type, construction type, and end-user. Among types, the standing seam segment held a major share of the global market in 2017, owing to high demand for durable and flexible roofs from commercial and industrial sectors. Among metal types, the steel segment is poised to constitute a leading share of the global market from 2018 to 2026. Furthermore, steel has high strength and fire resistance properties. It is widely applicable in the residential sector. It also offers comprehensive protection in all environments including harsh climatic conditions. Steel roofing systems provide significant protection to residential buildings including multi-story apartments, complexes, and single-family homes. Rise in the demand for steel roofing is augmenting the global metal roofing market. Among end-users, the residential segment is projected to hold a major share of the global metal roofing market during the forecast period. Metal roofing, especially steel roofing, has been widely used in industrial and commercial applications for the last few years. It is also becoming popular in the residential application, owing to its superior properties and significant protection that it offers. Significant rise in the number of apartments and high-rise buildings provides new opportunities to players operating in the metal roofing market. Furthermore, metal roofing can accommodate green technologies such as solar harvesting panels and water harvesting systems. Rise in the demand for energy-efficient metal roofs with built-in solar panels is expected to provide lucrative opportunities to roofing manufacturers in the next few years. The metal roofing market in Asia Pacific is likely to expand at a significant pace during the forecast period. Rising consumption of metal roofs in developing economies such as India, China, Vietnam, and Indonesia is expected to provide lucrative opportunities to metal roofing manufacturers in the next few years, owing to increase in the disposable income, growth in population, expansion of the construction industry, and rise in the number of residential complexes and industrial warehouses in these countries. Additionally, high investments in the construction sector and increasing number of commercial establishments in Middle East & Africa are projected to provide lucrative opportunities to the metal roofing market in the region during the forecast period. The report provides profiles of leading players operating in the global metal roofing market such as Owens Corning, Saint-Gobain S.A., Carlisle Companies Incorporated, ATAS International Inc., Tegral Building Products Ltd. (Tegral), Etex, Safal Group, Sunlast Metal Inc., Metal Sales Manufacturing Corporation, Thompson Architectural Metals Company (TAMCO), SKC Thailand Co. Ltd., CSR Limited, Coastal Metal Service, and Worthouse. Expansion in the portfolio of metal roofs through improvement in the existing products and development of new products with enhanced features and long-term agreements with construction contractors are strategies adopted by several prominent companies operating in the global metal roofing market.